1. La Mer Cream: Well it is the iconic product that is the brand. It really does keep the face moist, even on a 15 hour flight. I will always bring a little sample jar with me on the plane to keep my face and hands from drying up. A little side note, My family, friends and I have used La Mer cream for sunburn and insect bites. I think it is the soothing effect of the sea kelp. A friend even put it on her dog! 2. Eye Cream: I am a little ashamed to admit, I don't always use it. But when I do, this product does reduce puffiness and dark cirle under the eyes. Also I just love the fresh cucumber-ish scent. My mom resisted using eye cream until I made her try it. Now she is loyal and tries to get my dad to use it. 3. Reparative skintint SPF 30 is my daily do! I love that this protects the skin and give me a little basic coverage. This way I can get ready faster and be ready for the day. Not only does this makes getting ready faster, it also gives me a slightly glowing skin. This is the only one I have tried that results in glowing skin. What is there not to like about glowing skin and faster morning beauty routine??? 4. Hand lotion is the only one I can use without getting my palms all slimy and sweaty. For some odd reason, this is the only hand lotion I can put all over my hand without that slimy sweaty feeling. I have tried many brands to no avail. I believe it is important to give our hands as much attention as our face and neck. After all, a gal doesn't want smooth face and neck only to ruin the look with dry wrinkly hands. 5. Body Refiner: I was give a sample when I was pregnant. Since then I have used it weekly to polish the back of my hands, knees and areas I feel needs refining. Because it contains diamond and sea quartz, the skin is left looking sparkly. I especially like to use it on night out because I literally sparkle like a star, with soft soft skin! 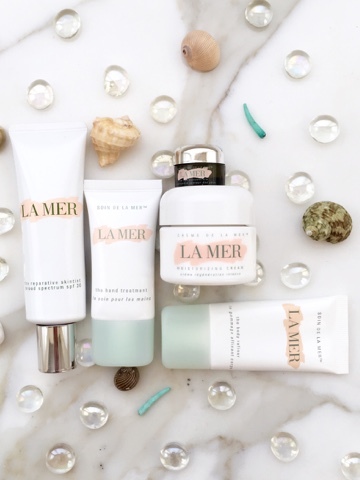 Are you a La Mer fan, what is your favorite product?